This week James Galway created a guessing game for us using his video camera and 16 different flutes. He wanted us to choose our favourites before he did the big "reveal" and told us what each one was. He even phoned me that week, and casually asked (with a huge twinkle in his eye because we used video-phone, and I totally saw that twinkle!) what I thought of the 16 flutes; which was MY favourite? Holy smokerollies, I only have UN-favourites, Sir Jim; only un-favourites. Here is an mp3, for this week's radio show, of my own 16 imitations of the tone colours of each of the 16 James Galway flutes. Fluteloops number 9 in which Jen imitates Galway's 16 flutes. The orginal Galway video on Youtube showing the flutes is linked at the above. Oh yes, and I do repeat snippets of each of Galway's 16 sound files for immediate comparison. No...ur...I...ah....didn't always manage perfection, but hey... I just HAD to have some fun during the game itself! Can't wait to see what the list of flutes was. And if you like, please leave comments (click the comment button) if you have feedback. Hi Jen, what a beautiful and funny analysis! Thank you very much. My very personal summary is very simple. I hear that you and he play flutes very perfect. A flute always sounds like a flute, and this is sooo good. Even my amateur flute sounds like a flute, hahahaha! That is why people like flute playing for themself, I guess. I hear, that Sir James and you are perfect flute players. But the differences between these playing examples are always very very small - or I am just not hearing good enough (yes, my ears are not the best). In general I prefer a more soft and less powerful sound as presented in these examples. I would be very happy to be able to do such an "imitation" myself, hahaha! but I always sound like me on any flute and my embouchure is happy to get a sound in the low register at all!!! You say, than the "Gold sound" can be produced on ANY headjoint, with perfect embochure. But if someone does not have this professional embouchure, can he take a gold headjoint instead??? Fantastic! 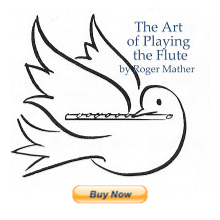 This was so fun to listen to as I re-read what I had written down about each flute. The next thing I want to do is to go through Fluteloops 9 again with my flute in hand and to keep pausing it to see if I can produce a similar sound myself. Thank you for the giggles! Can't wait for the revelation of which flutes are which from Sir James! I had a lot of trouble describing obvious differences between the Galway recordings - I could hear some differences but found the sounds more similar than different. I found your examples on changing sound illuminating. When buying my daughter's present flute, we blind-auditioned several on one occasion, with a couple of flute teachers. We repeated the effort several weeks later (minus one of the teachers), and surprised ourselves by choosing a different winner. We ended up with an Altus 1007 and chose it over a couple of 1107s for its beefier low end with similar sound! The particular one we chose turned out to have an obviously larger embouchure hole than the others. The Altus 1007 sounds darker than teacher A's Sankyo Artist, but light and thin in comparison to teacher B's Powell.